A Canberra native, Nicole Arrold is one of Australian hockey's finest players. Nicole represented Australia at both the Athens and Beijing Olympic Games, won Commonwealth Games Gold medals in Melbourne 2006 and Dehli 2010, played at three World Cups and six Champions Trophy Tournaments. Over a phenomenal 10-year international career Nicole amassed an incredible 215 International matches placing her 15th on the all-time match list. Throughout her entire career Nicole was an inspirational leader with her tough and uncompromising style who always played the game in the right spirit. 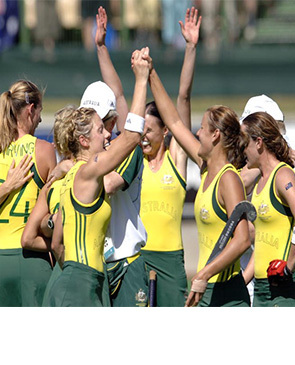 This leadership style saw Nicole rise to become captain of the Hockeyroos. Where ever Nicole played around the world her demeanour, skill and courage won her fans. Her infectious personality made her not only a great hockey player but a tremendous role model and a wonderful character. Nicole Arrold is the 402nd Hockeyroo and a fitting nomination for the ACT Sport Hall of Fame.